Filmed Saturday 12th February 2011 at The Marine Bar – Youghal. Playing live are The Steve Whelan Band & The Red House Blues Band featuring Bobby Lee. Experimenting with some camera settings on the Canon HV30. I coded this firefox add-on to query the Grooveshark search site much quicker than their standard search tool add-on. Grooveshark currently provide a useful search add-on, it installs Grooveshark search to your current list of search engines within Firefox. By searching for an artist or song you are directed to the Grooveshark website and results are displayed. I re-coded their XML install file to include a live suggest feature pulling related words as you type from Yahoo to speed up your search query. 2. And here is my improved version in action, as you type you will be prompted with relevant words speeding up your search, no need to click on magnify button. Just type, select, go. Note* I would prefer you install it via my Firefox Official Plugin page: https://addons.mozilla.org/en-US/firefox/addon/14319 this allow me to track downloads, installs and reviews etc. To uninstall the add-on just select “Manage Search Engines” from your drop down list then select and remove it. Note: This add-on will install to “Microsoft Internet Explorer” browser but the auto suggest feature is disabled. Grooveshark is a Rich Internet Application, (RIA) written in ActionScript using the Adobe Flex framework which runs in Adobe Flash. Its design implements various sliding panels to categorize and display lists of information, similar in style to that of the Apple iPhone. A right-aligned black modal window also slides in to display more information for songs, playlists, and users. Grooveshark also lets users upload music to their online music library through a Java Web Start application. The upload program scans folders specified for mp3’s, uploading and adding them to the user’s online library on the service. The ID3 information of the uploaded song is linked to the user and the file is uploaded to Grooveshark which allows on-demand music playback. Collectively, each user’s uploaded library is available to any user of Grooveshark. All content on the service is user-sourced. The website also allows users to upload music files on their hard drive to the search database, resulting in constant growth of its library. “The Future History ” Bobby’s current album is a collection of beautifully crafted songs that will take your soul, look after it for a few hours and then hand it back with a smile that says, “Yes everything’s going to be alright.” And you know what? You believe it. 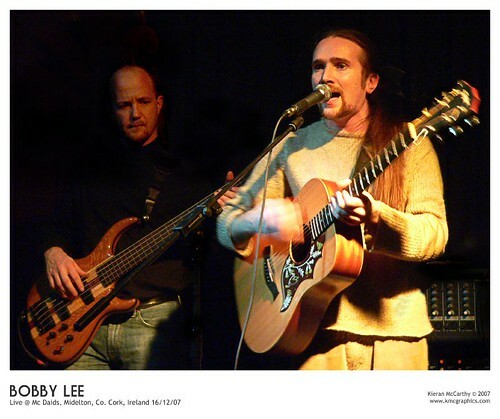 In 1996 Bobby Lee was hailed as “Irish Guitarist of the Future” judged by Donal Gallagher brother of the great Rory Gallagher. The prize was a guitar and amp, and a trip to London to Fender’s 50th anniversary celebrations at the Wembley Conference Centre. There he received the award in front of a glittering audience which included, Hank Marvin of The Shadows, Peter Green of Fleetwood Mac & Albert Lee amongst others. I will be editing the rest of the footage in the new year as a promo dvd for Bobby. What was interesting about the video shoot was it was filmed and captured direct to external hard drive as apposed to dv tape. This was my first time trying this technique and it worked out a treat, it was ready for editing straight away.